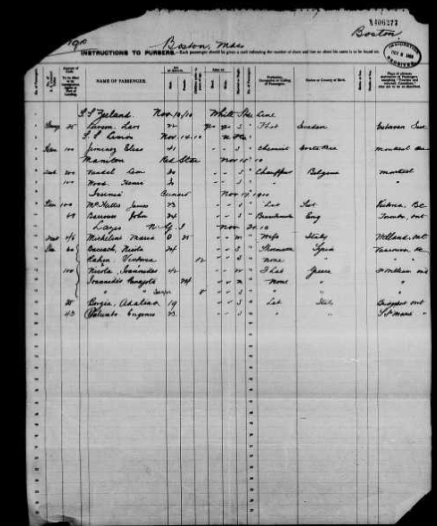 FamilySearch.org has a FREE database titled CANADA, PASSENGER LISTS, 1881-1922 which has 6,871 people listed with Greece as their place of birth. You will be able to view the actual Passenger Manifest. The lists for United States ports include only those names of passengers with intentions of proceeding directly to Canada. The Canadian government did not keep lists of emigrants. Before 1947 there was no Canadian citizenship separate from British, and Canadians moved freely throughout the British Empire. Before 1895, when the United States government began keeping border-crossing records, Canadians moved to the United States with few restrictions.